It is obvious that pregnant women need to consume highly nutritious diet that can nourish themselves and the baby in their womb. However, it is important for them to know more about the proper nutrition during this critical period. Taking prenatal multivitamin could prevent various health problems, such as preeclampsia. It is a condition that may cause various maternal complication and serious fetal issues. Before beckoning pregnant, women may need to take a multivitamin pill once a day and this could extend to the time of nursery. However, it is important to know that some health risks may not be reduced by regular consumption of multivitamins. As an example, overweight women may have relatively higher risk of preeclampsia, regardless of whether the consume multivitamins or not. In general, preeclampsia is a condition that happens at the later months of pregnancy. Common symptoms of preeclampsia include swelling of limbs, protein in the urine and hypertension. In more serious cases, fetal complications may happen, which is indicated by premature birth, low birth weight and even, stillbirth. When preeclampsia starts to develop, the best treatment is often delivery. It is important for pregnant women to know how to avoid preeclampsia and they need to be really serious about having proper nutrition. Any expert would agree that having good nutrition and proper eating jabit should ensure that the risk of preeclampsia can be minimized. It will be much easier for them if they already develop good eating habit, before mothers become pregnant. First of all, women with weight problems should reduce their weight before attempting pregnancy. This is important if they want to prevent fetal complications, they should be willing to work extra hard in reducing their weight before pregnancy. Overweight women may potentially develop high blood pressure, complications during delivery and gestational diabetes. However, underweight women have their own risks as well, such as having an infant with low birth weight. Regardless of their condition, pregnant women should get enough folic acid, which is important for the development of spinal cord and brain of the fetus. Neural tube birth defect is caused by low level of folic acid among pregnant women. They should get 400 micrograms of folic acid each day from supplements, fortified foods and normal foods. Natural sources of folate include citrusy fruits and green leafy vegetables. Iron is also important for pregnant women and in fact, it is important for them to accumulate enough iron before pregnancy. Many women regularly have low level of iron, due to menstrual period. 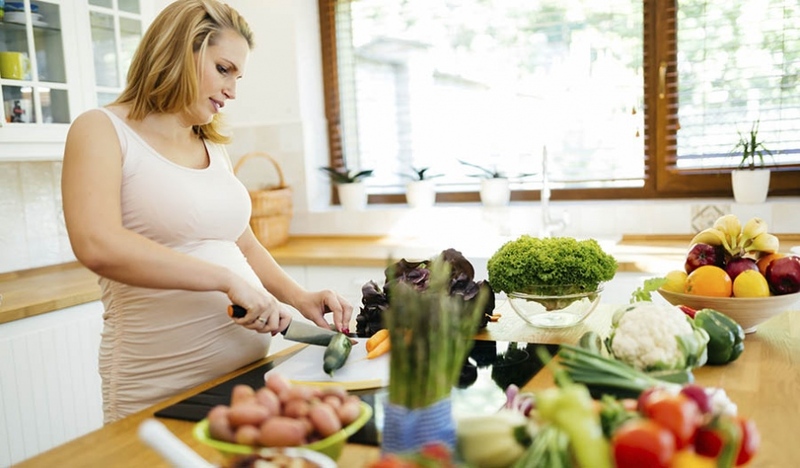 During pregnancy, it may be important to double the iron intake. A convenient way is to take an iron supplement at about 30 milligrams per day, both from pills or fortified foods. However, it is better to get more iron from natural sources, such as lean red meat, beans and green leafy vegetables. Vitamin C is also needed to improve the iron absorption in our body. Calcium is essential to ensure that infants and mothers have strong bone, during and after pregnancy.